Whether your college days have come and gone, you’re in the thick of them, or perhaps you’re almost there and anticipating the craziness that’s about to ensue, beer pong is definitely on the list of games you’ve played (or will play). There’s something wonderfully fratty about watching a ping pong ball soar into the air, or listening to that satisfying plunk as ball makes contact with sloshing, solo cup liquid. Combine that with another favorite, Connect Four, and you’ve got yourself the ultimate drinking game. 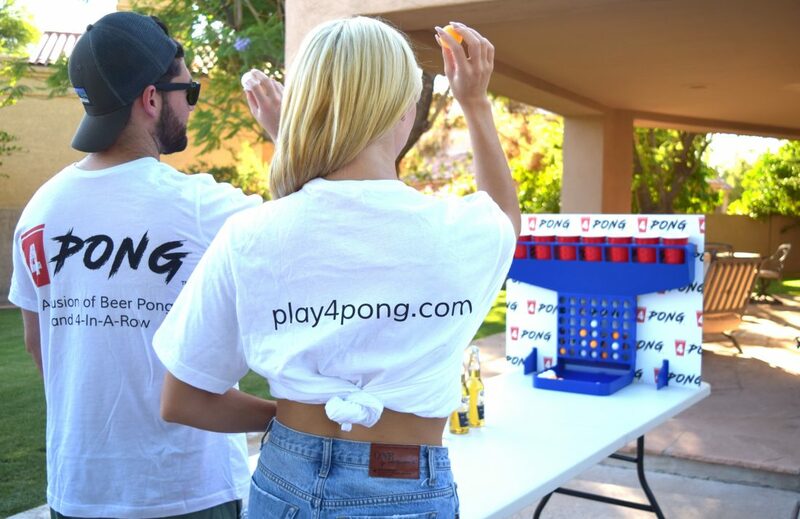 Enter 4Pong, a fusion of both that will take your house party, frat party, or college party to a completely new level. Gone are the days of playing basic beer pong with only four people, while the rest twiddle their thumbs. With 4Pong you get the fusion of the most classic drinking game, plus four-in-a-row that can be done seamlessly with more than four players, in two opposing teams. Not only that, this game brings back all the childhood memories of Connect 4 with a pinch of adult. Some of my favorite memories from college are the late nights at my best friend’s apartment post-softball tournament, sipping drinks and tossing those (probably dented by that point) little ping pong balls across the table. The laughs, bonding, and memories ties me to that group of people, even today today. 4Pong surfaces all those memories with even more options to get competitive. It’s something you need for every barbecue, holiday, pre-game, and house party. 1. One 4Pong game board. First, set up teams. Make sure there’s an even number on each side, or that you’re alternating each turn so that everyone gets a chance. Your goal is to get the ball in the cups (of course) and four balls in a row will win! Take turns with the opposing team, but go quick! You’re also allowed to have optional swigs, gulps, or chugs for missed shots. When you make four in a row—horizontally, vertically, or diagonally —your tea wins! Make the losers chug their drinks, do a crazy dance around the room, or 40 push-ups (just kidding). But whatever you decide the end result to be, easily dump the balls and start again! Let’s face it — basic beer pong gets old after a while. And regardless of whether or not you’re in college or looking back with nostalgia, you can up your frat party/college party with this best new drinking game, live as of today, November 7, 2018. Here’s where you can learn more about 4Pong, or if you’re looking to take your fun to a whole new level, you can purchase the game right here for an early bird discount (while supplies last). What Do We Do In A World Where Grief Is So Prevalent?